My current teacher felt I had enough training in dojos and comfortable environments, and instead decided that I should practice in someplace a bit more hostile. Considering that hot climates had never been my favorite regions when traveling, and that there wasn't a cloud in the sky, needless to say I was drenched in sweat as I worked with my heavy nodachi, breathing hard as I finally sheathed it and sat down with my canteen. A moderately armed A.D.N. Convoy was kicking up dust in the distance. Three troop transport trucks, each filled with a crew of 8 stored in the back with an extra man driving the vehicle. Sergeant Major Che Chachamaru was in the middle vehicle that was tearing up the heavily beaten and sandy road. She was riding 'shotgun', beside the driver inside the heavy and swaying vehicle. The half cyborg-half Elven woman stares at a clipboard detailing her new mission specs. 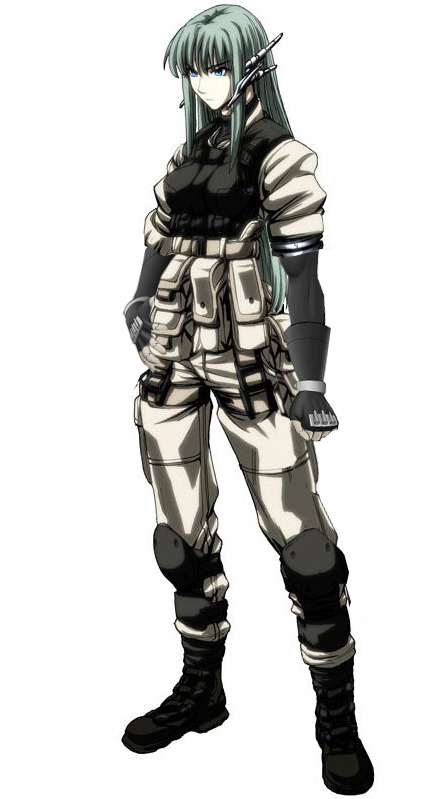 Instead of being transferred to deal with monsters aboard a Casino Resort, or to be sent on a mission to enforce the law on her Island hometown, she was being sent to Beijio City to lead the ADN Delta team and to provide relief to the panic stricken city that was looking more than ever like a war zone. She feels sick to her stomach, she never acquired the skill of 'reading in moving vehicles' and she knew it. However, due to her haste in being transferred to Relief Detail in Beijio, she was not formerly briefed on her mission. "Stop...STOP!" she orders, narrowing her beautiful slitted eyes. The transport stops, and with it so does the other two. "I'm going to--URK!" She has a hand covering her mouth, her cheeks puffing out and she was blushing a bluish-green. She kicks open the door, dropping the briefing files and sending them flying every where before running out into the dunes where she 'relieved' her stomach of it's contents...twice. The eerie blue/green runes pulsed with unholy power, and immediately the spire burst forth and coalesced a beam of power from it's apex at the ground a few dozen meters from it's base. The beam produced the first of many hellgates in the area. Che looked up seeing a large beam of light traveling several of hundred meters into the sky. Che slowly pulls herself back together, viewing the scene that was taking place from where Ithteca's Gorge would be. "What the bloody hell is going on over there?" she then turned a little more to the right and witnessed a similar beam of light travel up from where Asrond was located on the map, and it was closer to her position. She slowly backs away and without turning she calls out to the driver: "Get in contact with H.Q...I want to know whats going on over there. Stat!" she commanded.